How much faith do you have in the second season of the American Gods TV show on Starz? As we all know, the Nielsen ratings typically play a big role in determining whether a TV show like American Gods is cancelled or renewed for season three. Unfortunately, most of us do not live in Nielsen households. Because many viewers feel frustration when their viewing habits and opinions aren’t considered, we’d like to offer you the chance to rate all of the season two episodes of American Gods here. *Status update below. 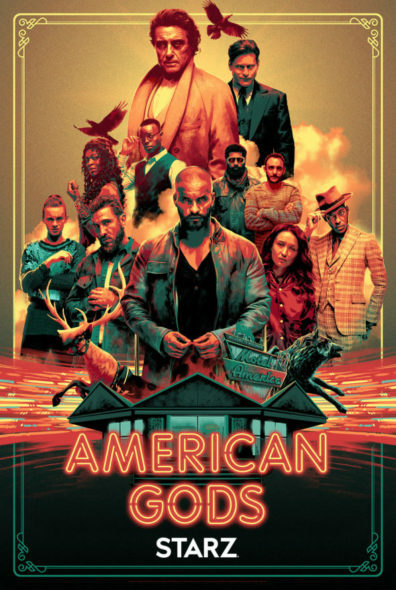 A Starz Americana fantasy drama series, American Gods stars Ricky Whittle, Ian McShane, Emily Browning, Pablo Schreiber, Crispin Glover, Orlando Jones, Yetide Badaki, Bruce Langley, Mousa Kraish, Omid Abtahi, and Demore Barnes. The season two cast also includes Peter Stormare, Cloris Leachman, Kahyun Kim, Devery Jacobs, Sakina Jaffrey, and Dean Winters. The story centers on Shadow Moon (Whittle), Mr. Wednesday (McShane), and a pantheon of gods — old and new — competing, and ready to do battle, for the hearts and minds of believers.